Evergreen High School’s 32nd Annual Academic Honors Recognition Ceremony gave over 220 reasons for the community to be prideful in the school, as students from all four grades achieved personal milestones whether achieving first year recognition or fourth year status. Just over half of the school’s near 400 enrollment received recognition. Mrs. Tina Jones, in her second year as the adviser to the school’s National Honor Society (NHS), who sponsored the evening’s program, opened her remarks by summing up the significance of academic achievement. “Academic Success is the heartbeat of any school. Looking at the long list of students being honored tonight it is evident that the heartbeat is strong here at Evergreen High School,” she said. To achieve academic honors, students must first have achieved honor roll or merit list status for the first semester of the current school year. For upperclassmen, students also need to be on the honor roll or merit list during the second semester of the previous school year. Honor Roll requires a Grade Point Average of 3.5, while merit list requires a minimum 3.0, both out of a 4.0 scale. Olivia Le Roux, 2016-2017 President of the NHS Chapter, opened the evening by welcoming guests and praising honorees for their hard work and devotion. “Students being honored persevere even with the most challenging assignments or tests, consistently and carefully complete all tasks, often going above and beyond the expectations for the class. These students are dedicated to academic success,” she said. With that, EHS Principal Josh Clark read through each of the 220 high achievers to be recognized. First year honorees receive an academic letter and a gold pin and certificate each of the following years. Four year achievers are presented with special plaques. First year Freshman achievers were Anastasia Baker, Connor Bartschy, Garrett Betz, Emily Bissonnette, Naomi Brand, Nicole Brand, Nathan Brighton, Eric Butts, Claire Conrad, Cassidy Cook, Tristan Cordray, Courtney Couts, Ashley Cutcher, Drew Donnald, Madison Dukeshire, Gavyn Dunn, Jack Etue, Sydney Fillinger, Brian Floyd, Brian Fritsch, Matthew Fritsch, Asia-Lin Gensch, Afrodite Georgakopoulos, Alexandra Gillen, Kayla Grant, Connor Hauk, Mikayla Heintschel, Julia Herdman, Garett Holmes, Michael Incorvaia, Kennedi Keifer, Emily Kerekes, Justin Krempec, Jack Krispin, Madison Loeffler, Alexander Majewski, Trinity Martinez, Hanna Miller, Morgan Miller, Victoria Miller, Kelsey Niles, Haley Nowalk, Korah Overfield, Tess Pennington, Gavin Rhodus, Josefene Rosinski, Chandler Ruetz, Kamryn Ruetz, Charles Saunders, McKenzie Schmidt, Bailey Schoendorf, Kahlan Schuster, Jack Schwab, Benjamin Schwan, Jacob Smart, William Smithmyer, Ayden Spradlin, Ryan Stasa, Wyatt Styer, Brandon Taylor, Allison Tietje, Augustus Tipping, Savannah VanOstrand, Lindsey Wade, and Emily Yunker. Sophomore Steven Hausknecht received first year honors. Sophomores receiving second year awards were Emma Anderson, Jacob Baranowski, David Carroll, Trevor Cobb, Claudia Cromly, Alexandra Davoll, Adam Dumas, Alexis Dunn, Autumn Ehrsam, Bryce Eisel, Olivia Kennedy, Kaitlin Kollarik, Kelsie Komisarek, Korri Kreuz, Myra Kuszmaul, Christopher Langenderfer, Alyssa Lindhorst, Collin Loeffler, Chandler Lumbrezer, Zachary Lumbrezer, Travis Markley, Alexis McCormick, Travis Mersing, Morgan Miller, Terrance Miller, Jared Mitchey, Karissa Moore, Sara Myers, Maureen O’Neil, Colten Pawlaczyk, Kyle Peete, Sydney Pfaffenberger, Hannah Pinkelman, Thomas Pollard, Zoey Rauch, Kendra Sanford, Maya Saunders, Sarah Schwan, Cecilia Silvestri, Aaliyahmae Smith, Chloe Smith, Claire Smith, Kyle Smith, Taylor Smith, Andrea Smithmyer, Makayla Stasa, Hunter Svoboda, Sierra Tack, Hunter Van Wert, Zoe VanOstrand, Sierra Vasquez, Haley Wade, Jack Worline, and Isaac Yunker. Juniors Kaleb Lumbrezer, Hannah Kreuz, and Trinity Welch received first year awards, while Hannah Abram, Kaitlyn Rice, and Taylor Smith were recognized with second year accolades. Juniors receiving third year awards were: Savannah Armstrong, Harley Blair, Jonah Blanchard*, Eleni Bordovalos, Patrick Brandt*, Grace Bryson*, Kelsey Buckenmeyer*, Shane Call*, Brendan Canfield, Margaret Carter*, Kenneth Cutcher, Lauren Day, Emily Dickens, Grant Donnald, Joshua Dowling, Nicholas Ekleberry, Katie Fritsch*, Victoria Fuller, Ashley Garlick*, Zoe Hallett*, Shannon Hardy, Drew Hassen, Livia Hein*, Kaitlyn Hendricks, Hannah Herr*, Alyssa Herrick, Deziree Jacobs, Sydney Kohler*, Noah Kreuz*, Courtney Krieger*, John Machacek, Nicole Miller, Dalton Mitchey*, Grace Mohr, Bailey Monahan, Aaron Pember, Hannah Pennington*, Hannah Prentiss*, John Ruth*, Cody Sieja, Emily Smithmyer*, Harleigh Snyder*, Jessica Styer, Bailie Sutter*, Alexis Truckor*, Jamie VanLoocke*, Bailee Walborn*, Serenity White*, Nichole Wilson*, Faith Woerner, and Adelaide Worline. An asterisk denotes NHS membership. Senior Landon Niles received a first year award, while James Hausknecht, Chase Hensley, and Catherine Krempec received second year recognition, and Lindsay Burroughs, Kyra Hein, and Gabrielle Jennings were awarded third year accolades. Seniors recognized as fourth year honorees were: Jayden Adamczewski, Dillon Bick, Devin Butts, Lindsay Carr*, Jenna Christlieb, Austin Cobb*, Evan Conrad*, Ian Davoll, Katelyn Dickens, Ryan Eckhardt, Rachel Finney, Katelyn Fletcher*, Megan Floyd*, Heidi Fritsch*, Nicholas Hudik*, Mallory Jones*, Amelia Kennedy*, Lillian Kuszmaul*, Olivia Le Roux*, Lauren Mayhugh, Kayla Miller*, Cassandra Moore, Sydni Myers*, Lindsey Newell*, Alyssa Noe*, Lauren Overfield*, Abby Pennington*, Michael Pupos, Alyson Salsberry, Leah Schwan*, Alexis Shipman*, Giovanni Silvestri*, Megan Simon*, Delaney Smith*, Stacia Tietje*, Phoenix VanOstrand*, and Kaitlyn Willson*. An asterisk denotes NHS membership. 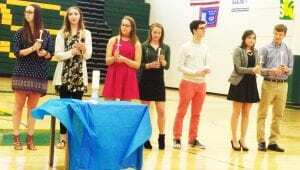 The 2017-2018 National Honor Society Officers were also installed. They are President Noah Kreuz, Vice President Patrick Brandt, Secretary/Treasurer Hannah Herr, and Reporter Harleigh Snyder. For all of the high-achievers, Jones had one last piece of advice: “As the end of the school year draws closer, I would like to leave each student with some advice I learned from my parents, my own Evergreen teachers, and from NHS membership in this Chapter. I learned early to always, always do my best and that whatever is worth doing, is worth doing well…Nothing in life is too trivial for this philosophy”. © 2017, Cory Johnson. All rights reserved. Be the first to comment on "Evergreen High School Recognizes Academic Excellence"